Five porcelain bowls of conical shape, the sides of each rising from a neatly potted, circular foot and flaring outwards gradually towards the rim. 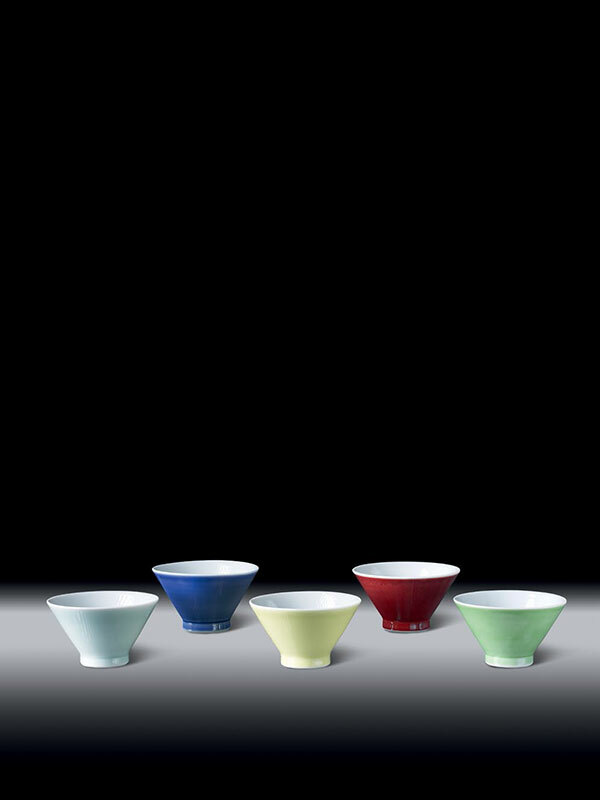 The exterior of each bowl is covered in a monochrome coloured glaze; pale celadon, oxblood red, lemon yellow, apple green and pale blue respectively. The base of each bowl is impressed with the maker’s mark. All the interiors are covered in a simple white glaze. The five bowls are contained within the original wood tomobako, which is inscribed Yohen, suidashi chawan, Asahi Hosai (Yohen style porcelain tea cups, made by Asahi Hosai) and with the seal: Asahi Hosai. Matsubayashi Hosai(1921 – 2004) was born as the eldest son of Asahi 13th in Uji City, Kyoto prefecture. In 1946, he succeeded as Hosai (Asahi-yaki 14th generation master), after graduating as a trainee potter at the Kokuritsu tojiki shikenjo (National Ceramic Pilot Centre, Kyoto). Matsubayashi was a devout Buddhist, and took Buddhist vows at the Daitoku-ji Zen Temple, Kyoto. His son succeeded as Hosai 15th (born in 1950) in 1995, and his works can be found at the British Museum and Victoria and Albert Museum in London. Asahi-yaki ware, based in scenic and historic Uji, has a long and celebrated history, with its productions spanning the last 400 years The great Tea Master Kobori Enshu (1579 – 1647) favoured the ware and used it in his tea ceremony. Both in shape and in the monochrome decoration these bowls strongly resemble Chinese porcelain examples.